Palestinian cartoonist Mohammad Sabaaneh hit the ground running in Chapel Hill, NC on November 6, when he launched his current US speaking tour with a public event at the University of N. Carolina campus there. He arrived there straight from the Raleigh-Durham airport after the 40-hour trip he’d taken from his home in Ramallah, Palestine. Sabaaneh shares technical tips with students in a UNC class on cartooning. After that UNC event, the pace of his tour continued to be super-brisk. Between Nov. 6 and Nov. 10, he headlined six public events, spanning North Carolina and Washington state. If you’re on Facebook, do check out the Photo Album we’ve been making there, that shares highlights from the tour. Sabaaneh is currently headed for the NYC area, where he’ll be speaking at seven public events between Tuesday, Nov. 13 and Monday, Nov. 19. (Details are on our tour calendar, here.) Along the way he will zip down to Washington DC by train, to star at the opening of the exhibition that the Jerusalem Fund Gallery is holding of his powerful linocut art. 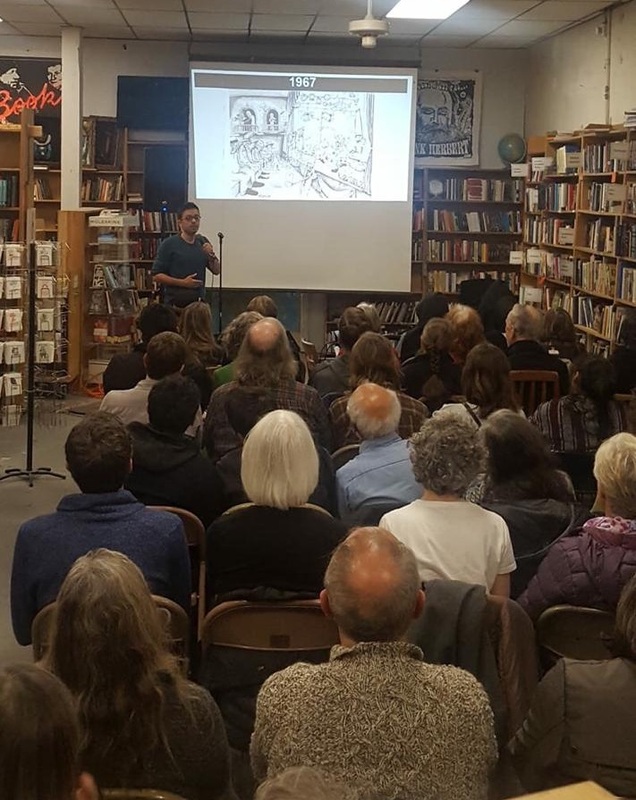 People crammed into King’s Books in Tacoma WA, to hear Sabaaneh. Sabaaneh is one of Palestine’s best-known cartoon artists. He contributes a daily cartoon to the daily Al-Hayat al-Jadida, in Ramallah, and also distributes the constant stream of cartoons that flow from his super-gifted pen globally, via social media. Last year, Just World Books published his first book of cartoons, White and Black: Political Cartoons from Palestine. The book has won rave reviews from his colleagues in the political cartooning community worldwide– many of which can be read here. Sabaaneh’s current U.S. tour is titled “Picture This! Life & Art in Palestine.” A gifted communicator in both words and images, he has two different kinds of presentation that he’s able to make during his appearances– one that focuses on exploring the terrible pressures that Israel’s now 51-year-long military occupation of the West Bank and Gaza have placed on the area’s residents, and one that describes some of the artistic choices he has made in the course of his work. 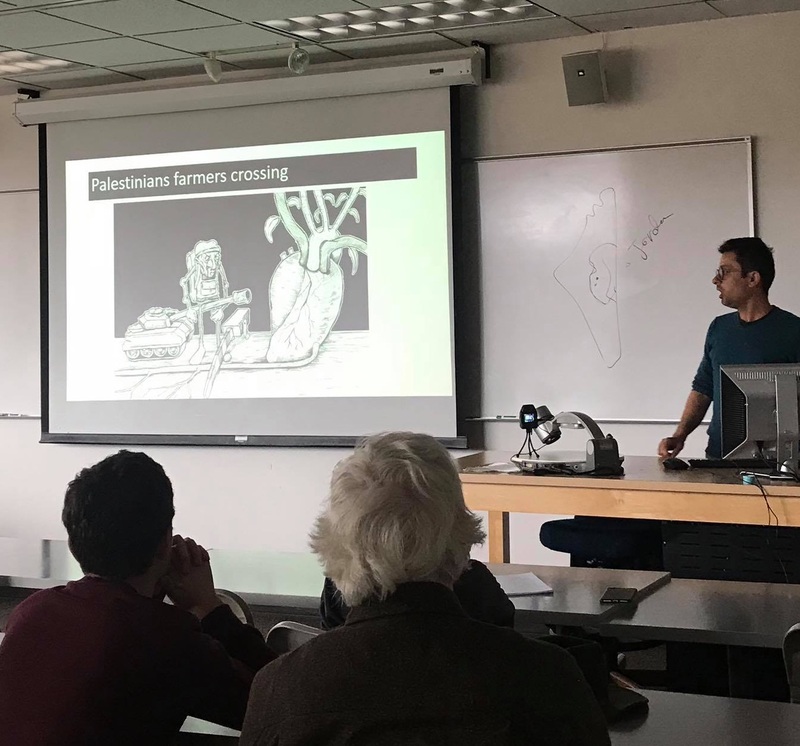 In some of the most riveting portions of his “life under occupation” presentation, he presents photos, maps, and diagrams showing different aspects of the oppression the occupation imposes on Palestinians in the West Bank– interspersing those with samples of the images he has drawn that capture the nature of that oppression in a powerful and memorable way. 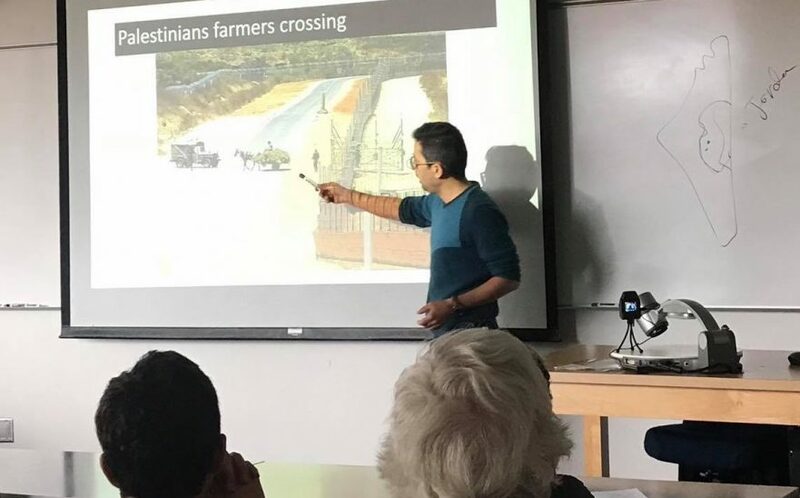 For example, the photo at the head of this blog post shows him presenting a photo of how Palestinian farmers often have to await the opening of special gates to they can cross Israeli-only roads to access their lands– while the image here shows him presenting the art he produced to convey that same reality. 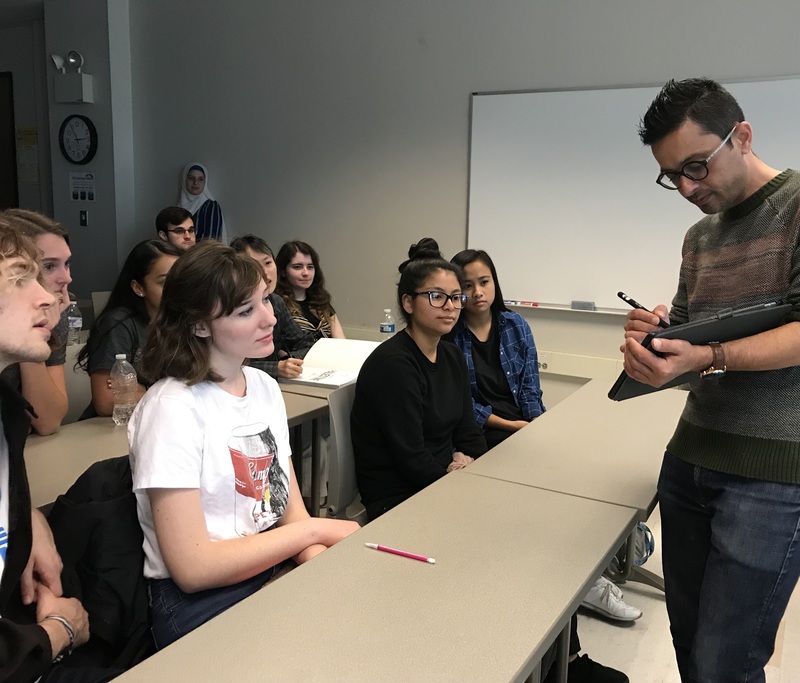 Students and others attending his programs engaged deeply with what he was saying, and his presentations have all been followed by far-ranging and informative discussions. Just World Ed is thrilled to have been able to organize this tour, along with so many of our partners across the Unite States… and now, we’re eagerly awaiting his return to New York City and its environs!